Finally a Creative Use of QR Codes That is Awesome-ball Cool! QR codes are utilitarian, sort of ugly — and when they were new in the US were way over used in ways that were, well, often terrible. You may recall I compared the use of QR codes as a creative hook to the use of inflatable rats. But even a QR code septics should recognize digital coolness, even when a QR code is the key to a great new technique. This week’s AdAge recounts a smart digital campaign by whiskey distributor, Diageo, that literally makes their millions of bottles able to carry messages from their purchasers. Using technology developed by software company Evrything, Diageo assigned an individual code that created a special identity for its whiskey brands in Brazil for a promotion timed to Father’s Day, celebrated there in August. When consumers scanned the code on the bottle using a smartphone, it allowed them to personalize a film template by adding a photo and a personal message to their dads. Dad could then view the film by scanning the bottle with his own phone. This is cool for a few reasons. Connecting video and gifts is a trick ripe throughout retail. Further, the campaign provokes the gift giver to establish a log-in, which adds them to Diego’s directly addressable market. Every manufacturer and distributor wants to reach through the channel to build their customer reach; this does it. Imagine if someday you were able to attach a greeting to anything you buy. Or, perhaps, your thoughts about your possessions as you use them. There’s Harry Potter-like magic in that idea, the power that your things can remember what you’ve said about them. That your gifts can carry your explicit sentiments. The QR medium just isn’t enough of a hook to be the message – but imagine if could help connect your message to the physical world. Yes, I still think QR codes are transitional technology, but this is a path that opens up a cool new retail medium. What do you think. 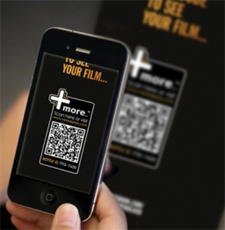 Is this a great idea, or have I become an arm waving QR fanatic?